You might recall the story of Kenneth Copp, a Pentecostal-raised man who joined the Amish and was last living in the Unity Amish community in Maine. We previous looked at the Copp bakery and furniture shop in a post from a reader who visited the family (Visiting the Unity, Maine Amish Settlement). Things have changed in Kenneth Copp’s life since that post appeared in 2013. Bangor Daily News recently ran an article on Copp along with a video which you can view below. Copp is no longer associated with the Amish church, and has apparently renounced his faith in God. It’s a sad story – he continues to live in the area, but his wife has left him along with their five children still living at home, and he tends his farm alone. “I think a lot of the Amish would wish me out of here. I’m such a thorn in their flesh,” he says. He says he is technically in the Bann, though it doesn’t seem he ever officially joined the Amish church in Maine. Members of the community sometimes come to his aid. Kenneth Copp also appeared in a podcast, discussing his “deconversion”, in 2015. You don’t often hear of non-Amish joining the Amish, then leaving again to arrive at atheism (former converts often find themselves in a more progressive Christian church of some sort). People join the Amish for different reasons – some may be driven by things like lifestyle aspects and romanticism more than the spiritual basis which Amish will tell you is essential. It seems Copp was one who for whatever reason lost the faith he had, and landed in the other extreme. Copp’s story is a good example that there is a lot more to being Amish than just wearing plain clothes and raising dairy cows. It seems like he has put himself in a difficult position between two worlds. But maybe that is actually easier than committing fully to either? Sounds like he’s a hypocrite, by that, I mean he sure doesn’t mind taking their kind help, but then criticizes them for their beliefs. He sounds like a very bitter man, blaming others for HIS mistakes & problems. He may not be a hypocrite, he may be struggling. 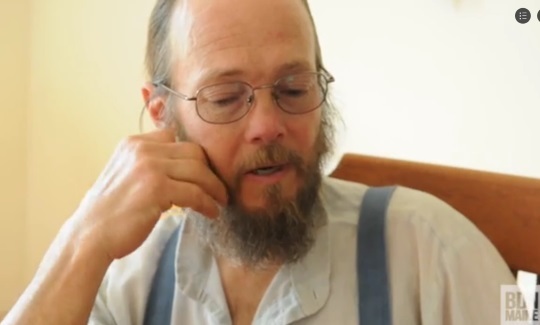 The Amish may be able to help him too because he was never baptized into the faith. A woman who grew up Amish but never baptized was allowed to work as a tour guide for them and associate with her family. The Amish may be hoping to bring him back to the fold. I had the impression that he was baptized/officially became Amish, but just wasn’t officially a part of this settlement for whatever reason. He technically shouldn’t be in the Bann as he claims in the video if he was never a member of an Amish church. With no answer, his faith started falling apart. So … is “science” ever going to answer such a question? Impossible! The best we can do with science is to propagate some theory as to the origin of the universe. No empirical evidence exists for origins, only theory. The current “Big Bang” theory, for example, is built around mathematical calculations and suppositions that very, very, very few people can even wrap their mind around. Those who make the calculations write them down in a book, and people read the book and swallow them as if they are gospel. But the Big Bang only takes people back to a tiny, tiny little mass, smaller than a pin head, that suddenly begins to expand into a universe of mind-boggling size. So, may I ask, where did the pinhead-sized mass come from? Does something come from nothing? Is that possible? Thus, science has nothing to offer about origins, only more and more theory that can never be proven, and only leads to more questions that can only be “answered” by more un-provable theories. Where did the Creator come from? He self-explains it with his name, Jehovah: “Always Existent One” (often given as “I am”). He revealed that name ages before the current scientific debate on origins began. Can I prove Jehovah’s claim scientifically? No way! Can I disprove that scientifically? No way! Science can never explain all of life’s mysteries. A common mistake of today is to make “science” into a god that has all the answers. I have chosen to believe the revelation of Jehovah. Not because I can prove or disprove it scientifically, but because of the personal revelation within my spirit. Those who chose to ignore the spiritual realm (called, in philosophy, “naturalism,” meaning the belief that no spiritual realm exists, only the natural or physical) are left with mere scientific hypothesis that can never be proven … and that the average person can not even understand. Whether Copp is a full-blown philosophical “naturalist” I do not know. I just found it interesting that he apparently left faith in God because of a question that science is incapable of answering or proving one way or the other. In other words, he appears to have rejected one unanswerable question (unanswerable by science, that is) for another set of equally unanswerable questions. God did not come from nothing. He has always existed. I Am … Eternally Existant One … is His Name. I have a BA in Biology and and year of medical lab school and later got a degree in Nursing. Since what I learned in Nursing went against the so called evidence of evolution, I ended up giving up my belief in evolution. Now I have even attended a lecture by a professor of law discussing court cases on origins. I feel evolution goes against all known laws of science and medical science. The Amish are more correct about origins than most University profs. The 2 + 2 = 3 because 4 is religion view of public schools is disgraceful to me. I side with the Amish on this topic. They are actually more scientific here. This poor man is in need of salvation, the assurance of which he must have never really experienced. His attraction to the Anabaptists seems to be more cultural than spiritual, seeing it all as an alternative lifestyle. He probably would have fit better in a hippy commune, sad to say. This man has been all over the map spiritually, seeking rest and finding none. He has become like a rudderless ship. He blames the Amish and Mennonites for his restlessness, but the problem is not them. It is deep within. The man needs to experience true inner peace, and that comes through Jesus, Peace and rest are available to all who trust in Him. I have serious concerns about his family. It appears they are standing with the faith and continue as believers, so they will be much in need of our strong prayer support. This must be a difficult situation for them. There seems to be much more to this story than this poor soul is telling us. Well said. I really feel sad for him and his situation. I have known others who joined conservative Anabaptist communities because they admired the lifestyle, but who experience difficulty with the religious aspects. I have advised many people to try and simplify their own lives without going as far as joining an Amish community (which is sometimes not as “simple” a lifestyle as they think) Low tech is not necessarily easy or “simple”. I have learned this over many years of working at it. I think AJ is spot on. Being or becoming Amish is not just about the lifestyle, but also the faith and culture. I would suspect the Amish would consider their faith the most important of these. Depending on one’s circumstances, there are more than a few ways one can become more like the Amish: waiting for others to finish speaking instead of interrupting them, giving up TV, letting others go first, cooking from scratch, etc. Having said that, being without air conditioning and using a horse and buggy in Phoenix, AZ does not seem smart to me. Again, everyone’s circumstances are different. Bloom where you are planted. Min. Terry Miller! I totally agree with you! Seems as though he’s never been able to reach out for the right thing & that is Jesus Christ! If he’d ever sincerely pray the sinners prayer maybe he could feel a change and except Him which is who he truly needs! ken copp needs some help in “decluttering” all the options that he’s tried to find a quiet place in his mind. wrap this man in kind words, kind actions and lots of TLC. hope he finds what he needs to give happiness, peace, purpose and love to himself and others. Not that surprising when you consider that many people have tried to join the Amish, but only an estimated 100 have been successful at joining in the past century. Living the life is more then simplicity from what I can tell. It’s the culture and faith too. A lot of people want that simple lifestyle without the rigidity of faith and culture, but with the Amish you don’t get to choose which things you want and which things you don’t. You can attempt to live that lifestyle without God like Copp is trying to do, but that has yet to be successful. People forget that the Amish aren’t a hippy commune. They’re a community with hundreds of years of history, tradition, and beliefs. You don’t just magically fit into the Amish just because you have dreams of some mythical simple life and want to be part of a greater spiritual community. Ken Copp strikes me as a true Christian seeker who has experienced so many different denominational creeds that he has become disillusioned in faith by all of the inconsistencies that he has found among them. Mr. Copp is also conflicted by the reasoning behind the Amish lifestyle and the hippies’ “back to the earth” philosophy. I pray that Ken Copp will be able to put aside all of the labels of Amish, Mennonite, Pentacostal, Conservative, Liberal etc. etc. that he is so focused upon, and simply find the truth of the Gospel in Jesus Christ. Sounds like kind of a nut, doesn’t he. I don’t know if he’s a “nut”, but he sure is LOST. He reminds me of the saying sometimes used by the old Hutterite elders….”The man is spiritually disturbed”, so say the least. Seeking the truthy can be a lonely pursuit. When your search threatens the peace of mind of your community they may reject you.